As sure as the seasons come and go, in November the next iteration of Call of Duty will be released, and even for seasoned fans of the series it’s hard to be that excited about that any more. This year might be a little different though, as Call of Duty: WWII has potential to breathe fresh life into a stale series – by going back to its roots. 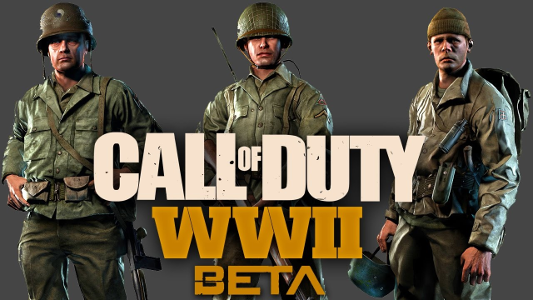 The beta of WWII’s multiplayer was available over the last two weekends, and for me at least it was the first opportunity I’d ever had to play a Call of Duty game before getting my hands on the game. You’d expect betas to have their teething problems, and I faced a couple, but on the whole I was very impressed. In many ways, Call of Duty: WWII feels like an extension and revamp of the Treyarch release World at War. Obviously it covers the same period, so there’s natural similarities in the settings and the weaponry, but the general pacing of the game and the skills required are often really similar too. Harking back to an age where Call of Duty was king is not a happy accident; I’m sure the great success of Modern Warfare Remastered helped focus the attempts to make a game that was more like the days. Almost since Black Ops II, way back in 2012, Call of Duty has revolved around this super-solider idea, where the player has special movement or abilities and the futuristic ability to call in a wide variety of air support and machinery to help win battles. WWII strips this way back, and the results are great. Instead of having an infinite supply of options to choose from in your classes, it’s back to having a primary, secondary, grenade, perk and that’s about it. It might be a case that having this limitation means you can’t vary play-styles too much, so one perk might not be enough, but so far it’s been enough to switch things about. Another change to the create-a-class system is that they have actual classes now. These are loosely modelled after different Army divisions, and come with their own special ability. Thinking cynically, it’s just another perk, but I think it’s a welcome attempt to bring in some form of role-play for the first time in a game that’s always toyed with the idea. As a World War II game suggests, the combat in this game is back to being focussed on gun-on-gun skill, and a reading of the maps and getting control over different points. Unlike previous Call of Duties which have brought in a ton of movement options, things are more restricted – with only the fabulous dolphin dive’s return being anything other than walking or running. That was the sort of style I was “raised” in, so going back to it feels natural and the way the game handles these one-on-one battles is very satisfying. Getting the upper hand on opponents is much more worthwhile, and chaining these moments together is a joy to behold again. All this is to say that the game is a little more difficult, as it’s hard to get into a position where you can’t be killed very quickly. It doesn’t take much to put an opponent down here, and one of the reasons why is the map design. There are only three or four maps in the beta, and while I think they strike a good balance in terms of size, they do tend to funnel people towards the same points over and over again. Yes, that’s what WWII battle was very often like – but the trenches and corridors leading to an open chokepoint that has an MG nest pointed at it isn’t ideal when trying to have a fun game. While it’s a beta, and the stripped back nature of the WWII genre does its part too, there is still good options when it comes to weaponry and class options. As the beta has gone on the level cap has increased, giving new options in each weapon class and new equipment too. The game does a great job of introducing variety in these weapons, with each having a unique feel – something that’s been lacking in an age of “modern” weapons which act almost always the same. There doesn’t appear at this stage to be any major balancing issues, although the default SMG the Grease Gun does feel a bit of a peashooter compared to later unlocks such as the PPSH. One of the best features of the game so far though is the return of the “War” game mode, which has inexplicably been missing since World At War. This follows the attack/defend of several points on a map, similar to Battlefield’s “Rush” game type or, more recently executed well, Plants vs. Zombies: Garden Warfare. Unlike the last iteration of “War”, this game type is completely removed from the normal environment of maps and killstreaks, having unique maps and lasting a longer distance. The different points that are to be attacked/defended all have different objectives, which range from simply holding an area to building a bridge, detonating a bomb or escorting a tank. Another cool feature is the drop of weaponry for defenders, including things like flamethrowers and bazookas. It’s been a long time since there was any real invention in game types, with Advanced Warfare’s “Uplink” perhaps being the closest to it in recent titles, but War’s return is a fantastic addition to a game that’s already brimming with a mix of nostalgia and modern gameplay. I’m really looking forward to World War II’s release in November, and it’s got the potential to be a real re-invention of where the series is headed. Sledgehammer Games only came on board to Call of Duty a couple of years ago, but so far they’re to be commended for creating real games that push an aging staple of first-person shooters into new areas. Hopefully this first real open beta can push forward some changes to the final product that makes it the best Call of Duty in years.